A randomized, placebo and gold-standard controlled clinical trial, investigating the treatment of incipient buccal caries lesions with CURODONT™ REPAIR was presented at the IADR 2018 in London. 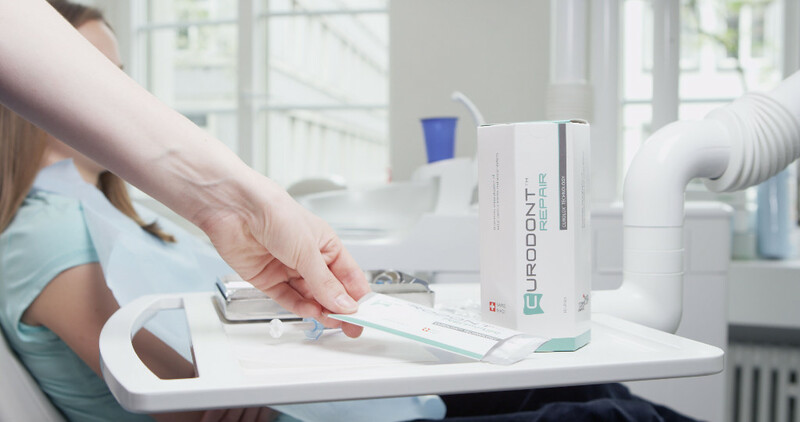 In this study Prof. Krejci and his team at the University of Geneva showed that the use of CURODONT™ REPAIR is superior to that of fluoride varnish or a placebo treatment. Link to the CREDENTIS homepage. The patented CUROLOX® TECHNOLOGY is based on self-assembling peptides, which form a 3-dimensional matrix with high affinity for the dental mineral. In pure form, CUROLOX® TECHNOLOGY is used in CURODONT™ REPAIR as a crystallization nucleus for new hydroxyapatite crystals. This gives dentists a non-invasive way to regenerate caries lesions and similar dental defects - Guided Enamel Regeneration (GER). CURODONT ™ D'SENZ is designed for the treatment of sensitive teeth. It utilizes the high bonding capacity of the CUROLOX® TECHNOLOGY to the tooth surface to form an effective protective barrier on the dentin. This quickly protects against painful stimuli. Headquartered in Switzerland, credentis is focused on the development and market introduction of advanced dental solutions based on its patented and award winning CUROLOX® TECHNOLOGY. Active in both medical device- and cosmetic- industry, credentis has a proven track record of innovative products and a strong university network. Dr. Dominik Lysek, CEO and Michael Hug, CTO have a strong track record in science, development and medical technology, with focus in the dental industry. Credentis highly experienced board members Dr. Werner Berner, Dr. Michael Peetz, Gerard Moufflet and Dr. Erich Platzer (chairman), contribute their pharma, medtech and dental industry expertise.